If you guys haven't figured it out by now, I love baby girl clothes. Georgia has a pretty extensive wardrobe that continues to grow all the time. I've already got her clothes for vacation bought since we are going in January to Punta Cana and the summer sales are on right now, my mom and I did some major damage at Target, Old Navy, and Bergners the last couple weekends getting her outfits for the warmer weather we will get to enjoy for a week this winter. 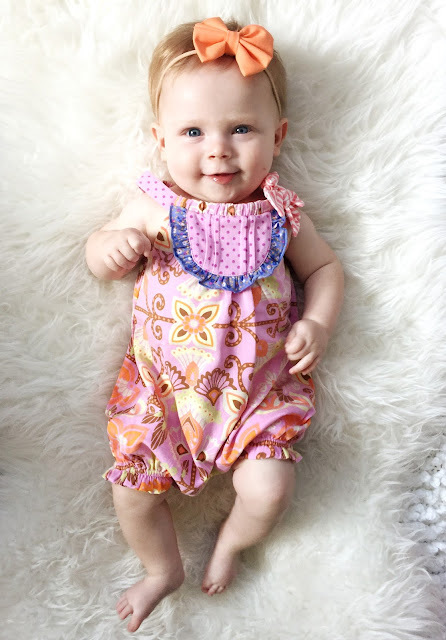 But aside from the big box stores, there are lots and lots of boutiques and smaller clothing shops with some of the most amazing baby clothes and recently I was introduced to Matilda Jane clothing and found some of the cutest baby, kids, and women's clothing I have ever seen. All of the pieces are very whimsical and remind me of an outfit I might picture a character wearing in a story book, seriously so cute. Their collections are actually called Make Believe, Once Upon a Time, and The Adventure Begins which I think perfectly describe the style of these adorable clothes. On top of clothing they also have things like lunchboxes, aprons & towels, water bottles, and more, but I was most interested in the clothing line. I went with the Ventriloquist Top because it looked like a perfect fall transitional piece and with it already being August, that made the most sense for my wardrobe. When I got this I fell in LOVE with the fabric, it is stretchy and soft, and long enough to wear with leggings and wedges or with some denim and flats both work appropriate. For Georgia I decided to pick a summer outfit for her since she is growing like a weed & we are getting pretty low on summer clothes that fit her. We got the Plein Air Romper which is so cute and colorful. Again, whimsical is the word that comes to mind when describing their clothes. And not only is everything super cute, their shipping is SO FAST. Seriously ordered this on a Tuesday and had it by Wednesday. 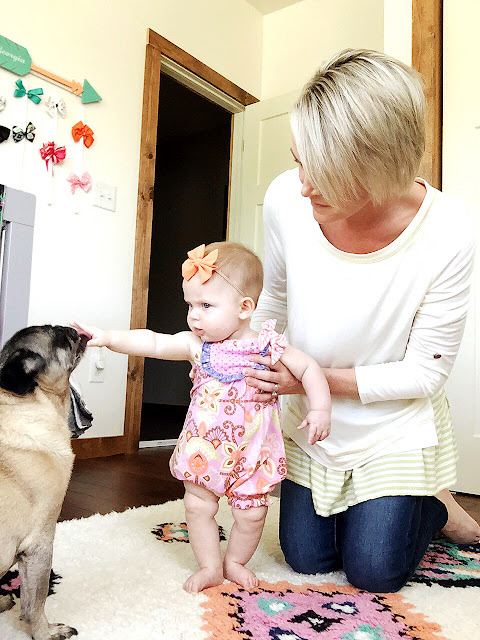 I'm excited to give away a $50 credit to Matilda Jane to one lucky winner! Enter via the Raffelcopter below. I used to LOVE shopping for school supplies. Allll the colored pens and notebooks and binders! This is my favorite romper. We got it too! Back to school clothes shopping is my favorite! My 9 year old still wears Matilda Jane. You should also check out Wildflowers Clothing. An old designer from MJ started her own brand and the clothes are ADORABLE! Georgia is such a cutie! Shopping for girls clothing is the most fun, and I loved doing it for my three daughters. I was pleasantly surprised that I have enjoyed shopping for my two grandsons, as much as I do. I love that all of MJ's stuff is so soft. I had no idea Matilda Jane had clothes for women - love that top on you!! Miss Georgia is adorable in everything she wears!! I love any sort of denim for back to school. The Matilda Jane patterns are so fun! I love that romper! I will have to go check her page out! I love Matilda Jane! Liddy has/had an outfit or two in every size! She looks adorable in her MJ. Georgia's outfits are always so cute! We're starting private school this year and wearing uniforms, but I'm excited to see my 5 year old wearing a romper and polo. Super cute! Love all of MJ's clothes! I like animal prints for my daughter. I love dressing both of my children in overalls and cute prints underneath! I'm loving the whimsical styles of MJ with cute shoes like Livie and Lucas and whatnot. My daughter isn't in school yet, but I still love buying her new clothes for the upcoming seasons. MJ's clothes are so cute! Love the romper! I really like the romper trend and dress my 8 month old in them all the time. For my older girls I'm loving the chambray trend. I love the plaid trend! My daughter loves tunics and leggings. Comfy and cute and very versatile. Thanks for the chance to win this awesome giveaway. I have always wanted to get some MJ clothing for her but its a little out of my price range. I have seen their products and have heard so many good things about the quality of their clothes. I would love to have an opportunity to try some out. Loving the leggings...my little is tall and skinny, so it works great! I also use them to extend the life of her favorite dresses when they become too short. And I'm thankful that there are unicorns everywhere because that is her favorite thing right now. My favorite back to school trend is leggings and girl maxis. The modern abaya kurti is a variation of the amazing garment in which it resembles a loose draping top, complimenting well with pants or leggings, and usually worn by women of all ages.